The 10-2 Oakland Raiders enter Arrowhead Stadium for a Thursday night AFC West clash with the 9-3 Kansas City Chiefs on a six-game winning streak. The Chiefs have won seven of their last eight games, and they’ve only been defeated once at home all year. The Raiders are currently atop the division by a full game, but a loss to Kansas City would put them in second place thanks to a head-to-head tiebreaker, and both teams better beware of Denver who sits on a 8-4 record. Kickoff is set for 7:35 p.m. in what is predicted to be a frosty evening at Kansas City with temperatures not expected to exceed 30 degrees. The Chiefs opened as a 3-point favorite, and the spread has not moved much with the tickets coming in fairly even on the two teams (46% vs. 54%). We have seen some line moves regarding the total as it opened at 47 points but can now be found at 46 at most shops online and in Vegas. The Raiders have covered the spread in five of the games during their winning streak, winning outright as underdogs twice, at Jacksonville and Tampa Bay. They came from behind to beat Buffalo 38-24 last weekend as Derek Carr put up another solid performance under center with 260 yards passing and a pair of touchdown passes. The quarterback from Fresno State has now put together three consecutive games in which he’s recorded multiple scores through the air. Oakland averages 28.8 points per game which ranks third in the NFL behind only Atlanta and New Orleans. The Raiders total yardage of offense is at 391.7 per game spread out on 277.1 yards of passing and 114.6 of rushing, both in the top 10 in the NFL. Oakland is not doing quite as well on the defensive side of the ball, giving up 24.9 points (22nd) and 389.7 yards per game (30th). They rank third in the NFL for take-aways/give-aways with a differential of +12. The Raiders are 10-1 ATS in their last 11 road games and a perfect 5-0 straight up and ATS on the road this season. They’re however just 5-16 ATS in their last 21 games in Week 14. Over is 6-1-1 in the Raiders last eight games after scoring more than 30 points in their previous game. The Chiefs are coming off back-to-back hard-fought victories as underdogs at Denver and Atlanta, winning by a combined four points. Alex Smith completed 21 of 25 passes for a total of 270 yards and a touchdown in last week’s 29-28 win at Atlanta, and Travis Kelce had a monster day in the passing game reeling in eight passes for 140 yards. The team had a total of 166 return yardage, and Dee Ford and Eric Berry are standouts on the defensive side for Kansas City, which forces the most turnovers in the NFL. Kansas City averages 23.4 points per game on the offensive side of the ball which ranks them in the middle of the pack, but their 333.3 yards of offense per game ranks just 23rd in the NFL. They have a balanced offense but excel at neither running or passing although Alex Smith is putting up solid numbers behind center. The Chiefs are allowing just 20.2 points per game which ranks in the top 10, but their 384.9 yards of total offense allowed per game is fourth worst. The Chiefs are 1-7 ATS in their last eight home games and just 1-4 ATS in their four games at Arrowhead Stadium this season. They’ve covered the spread in one of their last seven Week 14 contests while the under is 6-1 in the Chiefs last seven home games vs. a team with a winning road record. 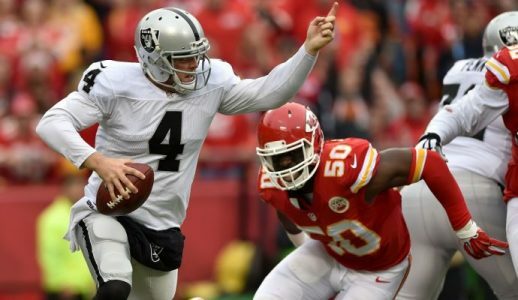 Kansas City defeated the Raiders 26-10 at Oakland on October 16, but the Raiders have been on fire since that contest. They’ll be looking for revenge, and taking the points on the visitors seem like the obvious play in what should be a close matchup. Find betting odds and premium picks on the contest at our Live Betting Odds & Lines page.